Hearing for the first time about Afghanistan Woman's National Football Team, I found it really courageous and brave of Afghan women rising from a country where the conditions are not favorable for females and where the controversies about female football players have to be taken seriously. Many people in Afghanistan believe it is shameful for women to play any sports, especially football which is thought to be men’s sport. Yet over the last years female football is on the raise in Afghanistan. It all kicked off with the establishment of Afghanistan’s first female football club in 2004. Spreading the message of girls playing football encouraged more and more girls’ interest in this sport and to register themselves in their school football clubs. In 2006, the number of women’s soccer clubs had already increased to four. The establishment of a women’s football committee in the Afghanistan Football Federation (AFF) opened another window of opportunity for Afghan female football players that year. Dynamics picked up pace so also in 2006, the Afghan National Women’s Football Team saw the light. Currently, the team has 25 members coached by Mr. Waheedullah Wahidi. With a great enthusiasm and much love in her heart for football, Khalida Popal joined her school football club five years ago. Her hard work and relentless efforts brought her to play in Afghanistan Woman's National Football Team and led her to seek new challenges to boost her skills and prove her decision to continue playing the game she loves. We spoke to Khalida to learn more about her unusual career. HBS: How do you feel as a woman football player in Afghan society? Khalida Popal: In a traditional ruled county like Afghanistan, getting educated and working outside the house is not easy for a girl, let alone playing football. People do not want girls to play football since they consider it men’s play rather women’s. I remember those days when I was practicing football in my school grounds, people came and watched us from the walls of our school since the walls were not high enough, and they offended us by annoying and insulting words. They even jumped inside our school yard and were trying to threaten or hurt us. The sensitivity of the subject increased when people began to see me on TV while playing and giving interviews. I was warned several times on the way to school by some people not to play football but I was not afraid or sat back for that matter. I moved forward to prove that girls can be strong in their decisions and that they cannot only work and study but also can do any sports they want. HBS: How did it all start, how did you get interested in football? Khalida Popal: I had a passion to play football since my childhood. During Taliban’s government I was living with my family in Peshawar. Coming back to Kabul after the fall of Taliban, I continued my studies in one of girls’ high schools where most of my classmates played football and encouraged me to join. Therefore, I registered as a football player in my school football club and started playing. During the selection process of players for the national team, I was so lucky to be selected by Afghanistan Football Federation to play for Afghanistan Women's National Football Team. HBS: How and where do you do the training? Khalida Popal: I have been playing football in defense position since the inception of the team in 2006. We do not have a proper place where we can do our training. We only practice inside the international military compound since it is impossible for women to play in open places as boys do. Adding to that, most of the families are not in the favor of their daughters to play openly in front of other people. The playground is also used for military helicopters to land which causes pauses during our training. For the training, we practice inside the international military compound in Kabul. I do trainings three times per week. Our practice is not only physical but we also study theory, for instance some films are shown to guide us, too. HBS: When studying international footballs, who are your favorite football players? Khalida Popal: My favorite women in football are Birgit Prinz and Marta Vieira da Silva and favorite male football players are Ronaldinho and Kaká. HBS: What events, playing for Afghanistan, have you participated in? Khalida Popal: Since the establishment of Afghanistan Woman's National Football Team, I have played many friendly regional matches in the second national tournament in Pakistan. I also participated in the Islamic Countries Women’s Football tournament in Jordan. Besides, I have travelled in Germany many times to attend preparation camps for improving the quality of women’s football and have played various friendly matches there. 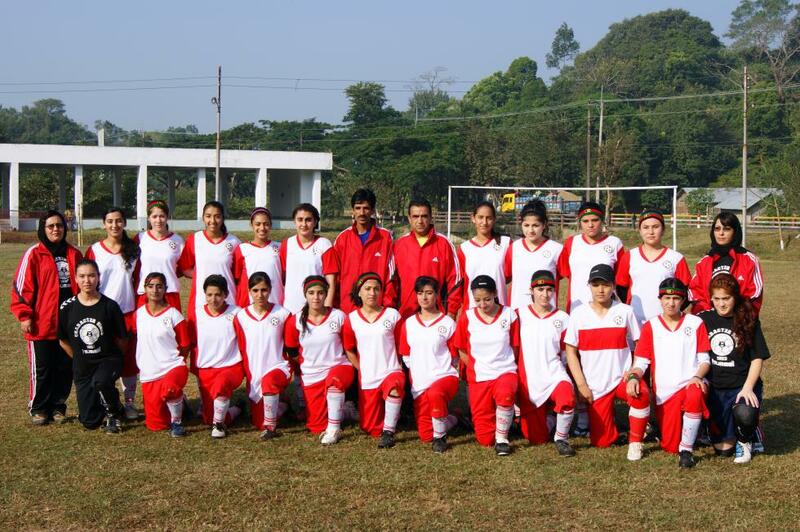 Recently, we have participated in the 2010 South Asian tournament in Bangladesh where we played our first international match against the Women’s football teams of Nepal, Maldives and Pakistan. HBS: So tell us about the team’s achievements. Khalida Popal: Each match that we play is an achievement for us, because we gain experience, we also find out our strong and weak points during the match we play and we take them as lessons learned which leads us to a big positive change in our next matches. But world recognition of our team is the biggest achievement for Afghanistan Woman's National Football Team. HBS: From your point of view: What is the difference between women’s football and men’s? Khalida Popal: Neither in rules nor in regulations there is any difference between the two. The only remarkable difference is the society’s perspectives of some people of our country. The men’s football team has lots of supporters and followers - while it is not at the same level for our team. HBS: What does a typical day in your life look like? Khalida Popal: Besides playing football, I am working as head of admin and finance of the AFF and I am the head of the women’s football committee as well. Every morning at five, I go to a private institute and study financial management. After that I go to AFF where I work as head of admin and finance until two o’clock. Then I move to the training facility where we train for two hours till the evening. HBS: What challenges have you faced since playing football? Khalida Popal: The situation in Afghanistan is a big challenge for us. Families don’t let their girls to play football. Since the security situation is not stable and some incidents occur unexpectedly so they don’t want to take the risk. Our national team consists of players from Kabul only. Due to the devastating security situation we cannot regularly travel to provinces to choose players for our national team, in addition to that, it is hardly acceptable for people from provinces to let female family members join football teams or allow them to do any other sport. Shortage of financial support is another challenge on our way. There is 15% of the AFF annual budget allocated for Afghanistan Woman's National Football Team which does not cover all expenses of the team throughout the year. That is why some of our international trips are canceled unless we are sponsored by the host countries. HBS: That really does not sound easy. What encourages you to continue? Khalida Popal: We had a friendly match with ISAF women football team one month ago, there I saw our people waving the flag of Afghanistan to us. Their encouragement strengthened us and made us play with a high level of energy and courageously. We won the match 1 - 0! It indicates that now our people gradually understand the importance of women’s presence in Afghanistan’s football scene. International media attention for our team has enhanced people’s interest and attracted some companies to sponsor our team. A Danish sports brand is sponsoring both the male, female and youth teams of Afghanistan. This company also arranges friendly football matches for our team in Denmark in July 2011. The company is going to take our team to attend the women’s football world cup in Germany. Also in Afghanistan, the more people hear and know about us, the more they get interested. I have observed an increased number of females joining football. By now we have 20 female clubs in Kabul and four in Mazar e Sharif, Bamyan, Kapisa and Jawzjan provinces. There are 500 registered female football players all over Afghanistan in different age categories. This shows that the level of interest will grow amongst females in coming years and we will have a well qualified football team of Afghan women. HBS: What is ahead for the Afghanistan Women's National Football Team? Khalida Popal: I see a bright future is waiting for us. We have our fans and supporters. People around the world know about us and some companies and donor agencies are willing to sponsor our team. Now female football is a growing in the country, and I hope for a better future and for enhancement in women’s rights in Afghanistan. I would like to ask the people of Afghanistan to support and encourage us. Please do not expect much from us, do not judge our team without taking into consideration the difficult situation we play in. HBS: Any message for Afghanistan’s youth? Khalida Popal: Let’s make sports a part of our live. No matter which sports you play, be committed and never give up. Khalida Popal, 23, is the captain of the Afghan national women’s football team. She works as head of admin and finance in the Afghanistan Football Federation (AFF) and is the head of the women’s football committee in AFF. The interview was done by Neelab Hakim and Abdul Rahim Ataee.